Sitri, alias Bitru, is a great prince, appeering with the face of a leopard, and having wings as a griffen: when he taketh humane shape, he is verie beautiful, he inflameth a man with a womans love, and also stirreth up women to love men, being commanded he willinglie deteineth secrets of women, laughing at them and mocking them, to make them luxuriouslie naked, and there obeie him sixtie legions. The Twelfth Spirit is Sitri. He is a Great Prince and appeareth at first with a Leopard’s head and the Wings of a Gryphon, but after the command of the Master of the Exorcism he putteth on Human shape, and that very beautiful. He enflameth men with Women’s love, and Women with Men’s love; and causeth them also to show themselves naked if it be desired. He governeth 60 Legions of Spirits. 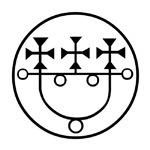 His Seal is this, to be worn as a Lamen before thee, etc.